President Donald Trump won't commit to saying the U.S. is demanding complete, verifiable and irreversible denuclearization of North Korea before removing sanctions on that country. Trump says: "I don't want to put myself in that position from the standpoint of negotiation." Trump told reporters at a news conference in Hanoi, Vietnam, on Thursday at the end of two days of talks that "we'll see if it happens," but that he has "not committed." As for any further meetings, Trump says, "It might be soon. It might not be for a long time." 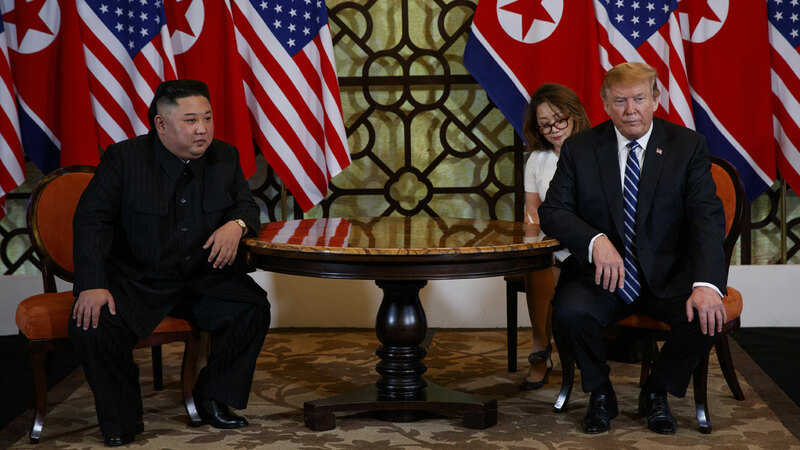 President Donald Trump is explaining the abrupt and early end to his Vietnamese summit with North Korea's Kim Jong Un by telling reporters: "Sometimes you have to walk." White House press secretary Sarah Sanders says the two leaders discussed denuclearization of the Korean Peninsula. She adds: "No agreement was reached at this time, but their respective teams look forward to meeting in the future." Still, Sanders is describing the meetings between Trump and Kim as "very good and constructive." Trump and Kim departed the hotel where they've been holding summit negotiations far earlier than planned Thursday. A joint agreement signing ceremony was scrapped. President Donald Trump and North Korea's Kim Jong Un have departed the hotel where they've been holding summit negotiations far earlier than planned. White House press secretary Sarah Sanders told reporters before Trump departed that there had been a "program change," but she did not provide further explanation about what had prompted the upheaval or whether any deals had been agreed to. Trump is scheduled to hold a news conference at 2 p.m. - two hours earlier than originally scheduled - before he departs Hanoi.